The constant overloaded work we face when we are in the big cities often keeps us away from things we like to do. Thus, many individuals would look forward to the holiday in order to ease their longing of conducting activities that they yearn to do when they are busy dealing with their daily lifestyles. Spending your holidays in a foreign country is often an exciting adventure for one to look forward to the unexpected occurrences he/she may experience in a different country. However, if you are still looking for some exciting activities in Sabah, you may want to try out the Kiulu White Water Rafting located in Tuaran. After an exhausting exploration of the many surprising elements in the state of Sabah, it is often good for one to take some time off the discovery journey and indulge in activities that will wash their tiredness away. This is especially important for one to pump up their energy for their next explorations in the state. The recommended place for one to try out in Sabah would be the Kiulu White Water Rafting, which is definitely the ideal activity one can find in the state of Sabah. Upon trying out the Kiulu White Water Rafting, one would expect him/herself to get rid of the exhaustion one feels after the various expeditions in the state, and in the same time, it is also yet another exciting and thrilling activity for one to be involve in so that one would be able to obtain another fresh and exhilarating memory to be added into the album of his/her trip to the state of Sabah. 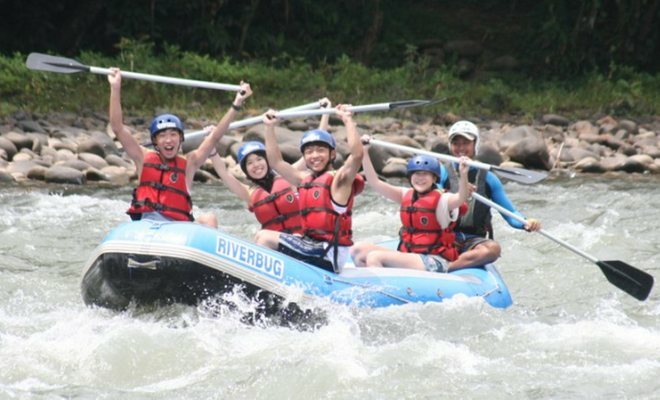 The Kiulu White Water Rafting is especially suitable for individuals who are seeking for a more adventurous and exciting activity in Sabah to spice up their stay in the state. Besides of having fun trying out the challenge offered by the rafting activity, one would also find that they are being exposed to the beauty of the Mother Nature while they are at it. Along with the ferocious rushing water beneath the bodies of the individuals, one can also grab the chance to have a quick look through on the land structure of the area in which the rafting activity will bring him/her through; and in the same time, one would be able to catch a quick glimpse of the flora and fauna residing near the area, if one is lucky enough.